Angela Drummond started her own business when she was 25. “There are no barriers in life; you can have it all,” she assured a room full of students in the Virginia Beach Student Center. Drummond, the keynote speaker for Women’s History Month, is CEO of SiloSmashers, an industry-leading strategy management and technology consulting firm focused on the federal government. Tidewater Community College’s Women’s Center sponsored her talk as part of its “Women as Entrepreneurs” series. The native of Fairfax, where today her company is based, admittedly wasted her parents’ money initially in college. “I should have gone to a community college to figure out what I wanted to do,” Drummond said, switching from business to fashion merchandising while at Radford University. She and two friends developed a business plan for what is today SiloSmashers, launching the company in 1992 with $3,000. She is proud of the integrity her company has developed and the efficiency it has produced in specific areas of the federal government, including assisting the Federal Emergency Management Agency with disaster preparation on the heels of Hurricane Katrina. Passion. Drummond defines that as the positive energy required to make every day a productive one as CEO. “If I don’t have energy when I open the doors of SiloSmashers, people aren’t going to follow me,” she said. People. Drummond surrounds herself with people she trusts, and she asked each student to write down five people to help them grow their business ideas. Purpose. 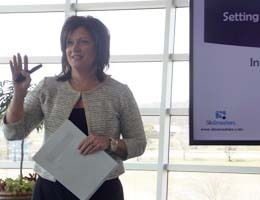 Drummond targets her company’s role, adding that solving problems is key.